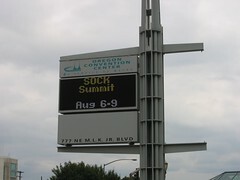 I'm likely to ramble on a bit about the Sock Summit here and there and everywhere for the rest of my days. I'll just start now with some random thoughts and images. Part 2 will come soon. 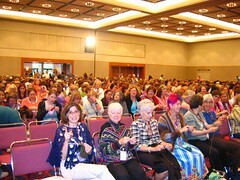 Yes, it was a convention center full of yarn. There are that many of us. 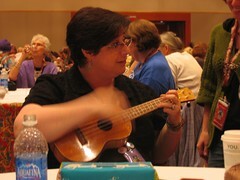 Amy knitty playing the ukelele at the opening reception. She told me I had bright eyes and also complimented me on my pattern frankensocks. I just kept giggling and nodding and screaming like a banshee (that last part was just on the inside). I also got to take part in the breaking of a world record as defined by Guinness: The most number of knitters gathered together to knit at the same time. We did it for 15 minutes and used straight needles. I was lucky enough to sit right behind Barbara Walker, but was too shy to talk to her directly, of course. 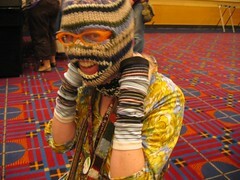 Here is Lee of the Leethal blog, attending the Luminary panel in the handknit ski mask she made. If you click here, you can see silly pictures of ME DANCING at the Ravelry party. I was not drunk, but so sleep deprived that my criteria for good decision making was severely compromised. So, yeah, some random highlights. In our next installment, I'll tell you more about the classes, the marketplace, and the story of how I came to own a pair of Barbara flipping Walker's very own personal handknit socks! Sock Summit was fantastic--and so was your workshop!